…well, I usually eat 3 or 4. 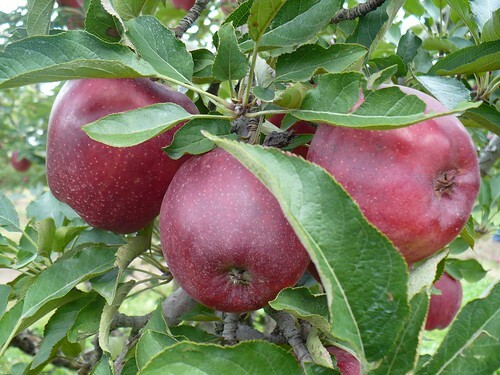 I don’t eat them for health benefits or because they are cheap or for whatever other reason – I just like the apples. I like them fresh, cooked, in a pie, in a cake, baked, in apple sauce, with caramel or honey, sliced, peeled, unpeeled and I like most of the varieties. Every year we try to make a trip to a local apple orchard to pick some fresh fruit. I was a locavore before it became trendy and people started doing it to feel good about themselves. We are surrounded by many apple orchards. There is Vaughn’s in Weston, we were going there for years, Schreiman’s in Waverly, it’s not u-pick but is very nice and in a beautiful historic area; and for the last couple of years we are picking apples at Pome on the Range orchard in Williamsburg, KS. Besides apples and pumpkins they also sell fruit wines some Kansas-grown produce, jams, honey and other things that are good for you. Today they had their annual fall festival but it looks like they still have plenty of apples to pick for the next weekend or three. If you are in Kansas, especially South Johnson County, you are just 25-30 miles away. Not only you will keep the doctor away, you will be able to brag about eating local and catch envious looks of your not-so-hip friends. While you are at it, mention that you only drink Shatto milk to completely crush them with you locavorness. For the next year I am keeping an eye on the Wagon Wheel Orchard which was picked out early this year due to being very young. They seem to have a great variety – something I am always looking for.